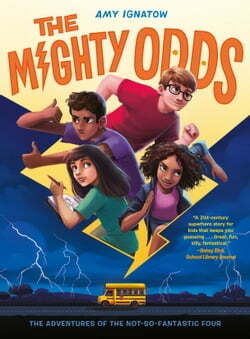 From the renowned author/illustrator of the Popularity Papers series, Amy Ignatow, comes the first installment in a new series about a diverse crew of middle school kids who develop very limited superhero powers after a strange accident and manage to become unlikely friends on the adventure of a... read more lifetime. &#160; When a sweet nerd, an artsy cartoonist, a social outcast, and the most popular girl in school are involved in a mysterious bus accident, this seemingly random group of kids starts to notice some very strange abilities they did not have before. Artsy Martina can change her eye color. Nerdy Nick can teleport . . . four inches to the left. Outcast Farshad develops super strength, but only in his thumbs. And Cookie, the It Girl of school&rsquo;s most popular clique, has suddenly developed the ability to read minds . . . when those minds are thinking about directions. They are oddly mighty&mdash;especially together. &#160; This group&mdash;who would never hang out under normal circumstances&mdash;must now combine all of their strengths to figure out what happened during the bus accident. With alternating narratives from each of the heroes, including illustrated pieces from Martina, and featuring bold female superheroes and a multicultural cast, The Mighty Odds is The Breakfast Club for a new generation. &#160; For more books by Amy Ignatow, check out her critically acclaimed Popularity Papers series: Book One: Research for the Social Improvement and General Betterment of Lydia Goldblatt and Julie Graham Chang; Book Two: The Long-Distance Dispatch; Book Three: Words of (Questionable) Wisdom; Book Four: The Rocky Road Trip; Book Five: The Awesomely Awful Melodies; Book Six: Love and Other Fiascos; and Book Seven: The Less-Than-Hidden Secrets and Final Revelations.